Cosette was a stray cat. Cleo, Madelynne, and Sagittarius were shelter pets. If I hadn’t adopted them, they may well have died or been put to sleep. The pet population is a staggering problem. Only one kitten out of every litter ever gets a lifetime home. If we were to all adopt one pet now, the excess would still far outnumber the ones with homes. Millions of animals are put to sleep in shelters every year. Dan, the animal control officer that saved Cleo and Madelynne, told me once about three Shar-Pei puppies that had to be put to sleep. "They were adorable,” he told me “One of them had the most incredible green eyes. I kept them for over a month, but no one came to adopt them. Eventually, they had to be put down." He adopts dogs and cats whenever he can, but as he told me "You can’t take them all home." Please make sure your pet is spayed or neutered. An unspayed pet can result in thousands of offspring. some might get homes, but the vast majority do not. There are also health benefits to spaying or neutering your pet. 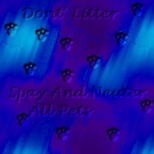 Males are not as aggressive, do not wander as much and generally do not spray the furniture if they are neutered. If you cannot afford to have your pet spayed or neutered, check with your local animal shelter or humane society. Many of them have low cost spay and neuter programs. Check for more information. If you are looking for a pet, consider adopting from your local animal shelter. The cost of spaying or neutering is usually included in the price. If you adopt just one pet, you will be saving a life.